Are you looking for the best hard anodized cookware? This here is your definitive guide. 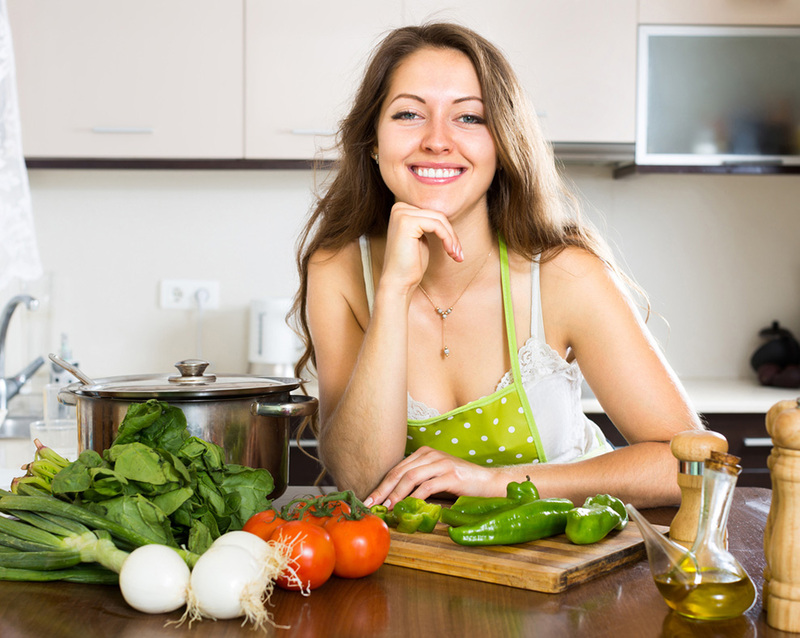 There’s a great number of things that worry people nowadays as far as their cookware is concerned: Price, reliability, eco friendliness and, of course, safety and material. All of these things are worth taking into consideration but none are as important as how safe the materials used to create your cookware are. 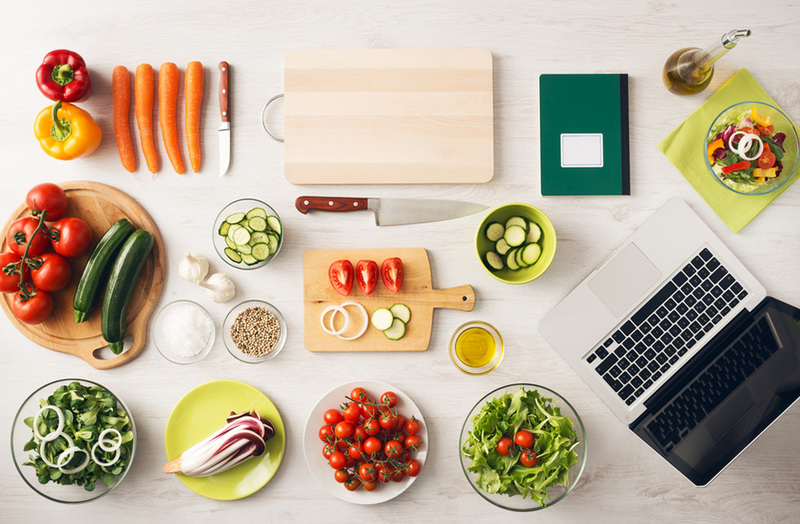 After all, your cookware is constantly in contact with the food you’re going to eat so it pays to get the latest in cooking technology. You can also check the Red Copper Pans Review. What is Hard Anodized Cookware? Anodized cookware is just another name for aluminum cookware treated with a special electrical process named anodization. This process involves submerging aluminum cookware in a special solution and then expositing it to a strong electric current, which creates a hard, non-reactive surface on your cookware utensils. A material that reacts to certain substances is called a reactive material, which means a non-reactive surface is one that doesn’t react to substances at all. In terms of cookware, a ﻿﻿﻿﻿non-reactive cooking surface is one that doesn’t react with your food by changing its color, taste or even properties. What materials do this, you ask? Well Copper, Steel, Iron and Aluminum tend to be reactive but are often used because of how responsive they are to heat which is why creating a non-reactive coating on aluminum cookware is such a good idea, because you get the best of the material without the downsides. As we mentioned before, one of aluminum’s best properties is just how responsive it is to heat. This means that it will heat up and cool down really quickly, which can help you when cooking delicate recipes. Not only that but aluminum is affordable and can take quite a beating. It’s non-corrosive, heat resistant and, generally, a very cost effective option when it comes to cookware. It comes as no surprise, then, that anodized aluminum has the same advantages while also improving on the already good material. The anodization process not only gives the cookware a non-reactive surface (which makes it even better to cook) but it also gives it non-stick properties that rival those of stainless steel. Perhaps the biggest thing to keep in mind when looking for anodized cookware is the fact that sometimes, manufacturers use the anodized aluminum as a base, rather than a cooking surface. While this undoubtedly works to give the cookware wonderful heat conduction it also means that the surface that’s in contact with your food isn’t anodized aluminum and is often something else entirely, such as ceramic cookware or some kind of non-stick surface, such as Teflon. This completely defeats the purpose of purchasing anodized aluminum (to reduce your possible exposure to chemicals that are released during cooking) so be selective with what you purchase. Now that you know all there is to know about anodized cookware is time for you to see what the market has to offer. T-fall is one of the world’s best known names when it comes to cookware thanks to the fact that they’re always looking for ways to improve. Because of this, we’ve changed our previous selection, the T-fal signature line, for the ultimate hard anodized line, which brings to the table all the advantages anodized cookware has, all while staying true to the brand, both in price and quality. This 12 piece set comes with the signature t-fal temperature indicator, a wonderful non-stick surface that makes cleaning a breeze to clean. 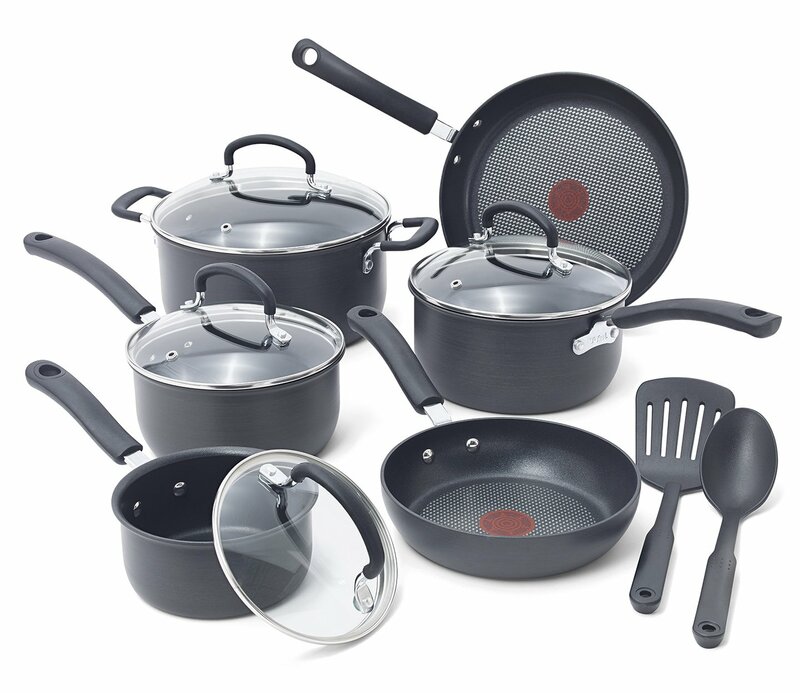 Better yet, this anodized set is one of the most resistant T-fal has ever created and, as such, it’s dishwasher safe, oven safe and it can even be used with metal utensils. While anodized aluminum is known for being rather hard to maintain, that’s not the case with the T-fal ultimate hard anodized set, which practically takes care of itself. That said, there are a couple of things you need to take into consideration when it comes to this set. For starters, it’s quite lightweight and it can slide off your cooktop if you’re not careful. This also means you’ll have to hold your pots and pans when stirring things. 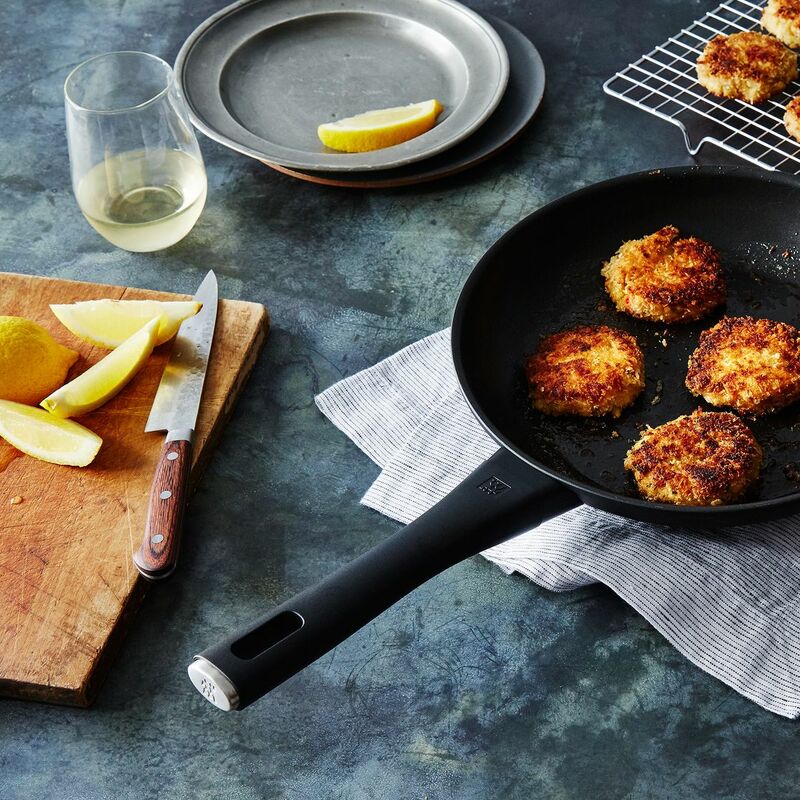 When it comes to nonstick, few brands are as well-known as T-fal and that’s because this brand is great when it comes to offering great quality for small budgets and this set is no exception. This is the most affordable item in this list but also one of the best sellers, as its nonstick properties and good collection of pots and pans are nothing to sneeze at. Better yet, out of all the items included in this list, this is the only one that comes with anodized cookware safe utensils, which is always a plus no matter how you see it. This set is oven safe, sturdy and very durable. The handles are comfortable and everything feels quite solid in your hand. The titanium base on these makes it scratch resistant and even dishwasher safe but it isn’t as good as conducting heat as other combinations so there’s that little downside to consider. One of the best things about this set is the little thermic spot in the middle, which will help you tell when the pans are hot. It’s a simple characteristic that people can comfortably live without but it’s a nice touch that’s worth considering. The utensils provided are rather flimsy and can break with time. ​Only the pot is dishwasher safe, but it’s still recommended to clean by hand to minimize any risk of damage. Cuisinart is one of the most reliable cookware brands out there and it’s easy to see why. It offers great quality for the value consistently through their products and this particular anodized cookware set is no exception. The Chef’s Classic has all the advantages aluminum cookware has, such as fast and even heat distribution, the non-stick cooking surface and the sturdiness. It’s even oven safe, which is also a plus. The best thing about this set, at least in my opinion, is just how varied the “Chef’s Classic” collection is, as you’re able to find just about everything for everyone’s needs. 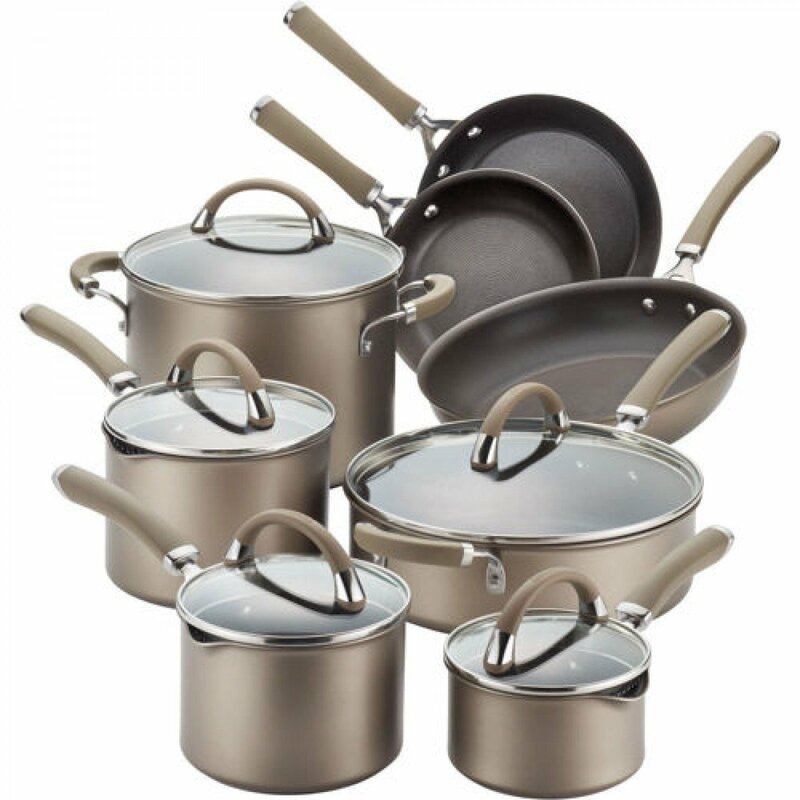 My favorite set is the 14 Piece Cookware Set, which comes with a strainer, break resistant lids and all kinds of﻿﻿ pots and p﻿﻿ans. Enough to satisfy even the most demanding family. That said, the fact that these super varied sets offer no utensils is a bit of a letdown. As with every other non-stick cookware, particularly that without a Teflon cover, using metal utensils is a big no, as it will scratch the surface and damage really fast. There’s also the issue with the dishwasher, which can’t be used for the same purposes. 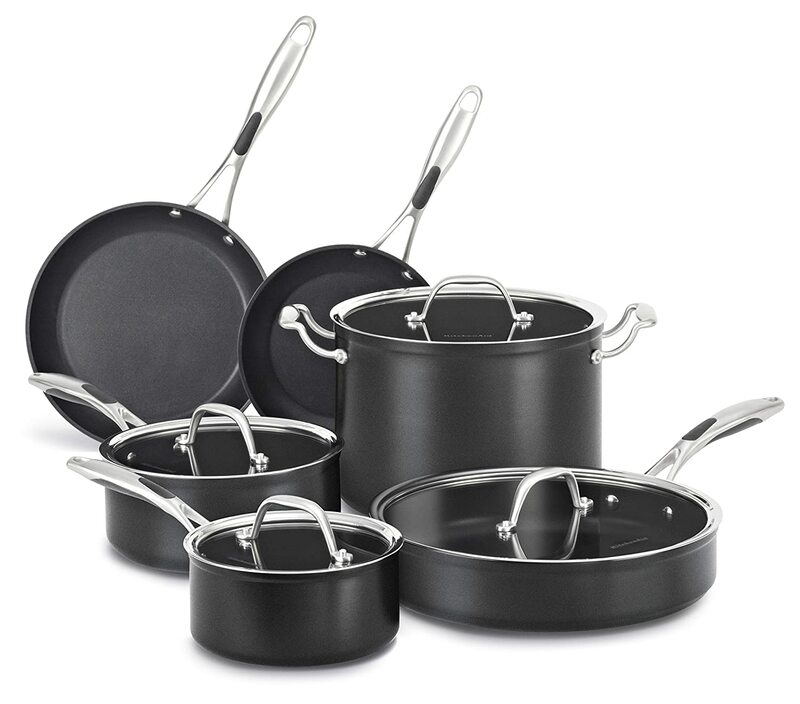 This eight-piece anodized cooking set has frying pans, sauce pans and a stockpot, all with their respective bits and they’re all a pleasure to look at, particularly if you like giving your kitchen a minimalist look. This set is oven safe, nonstick, and affordable, which is a great combination when it comes to cookware. That said, it does feel a bit too light, which can be off-putting for some. The nonstick surface is very reliable and reacts very quickly with heat, which is exactly what to look for when it comes no anodized cookware. Unfortunately, the pieces are rather small and will scratch very easily if you don’t use plastic, silicon and wooden utensils. Heavy handles that can tilt the pans sideways. The warranty can be rendered null if you’ve used metal utensils. The first thing you’ll notice about this cookware set is its elegant appearance. The second thing you’ll notice, once you start using it, is that it cooks just as good as it looks. This non-stick, sturdy and solid set delivers one of anodized aluminum best qualities om spades: It’s strengths. This cookware is something else. It’s heavy I the best way possible, the handles are comfortable and sturdy enough that they feel like they can take a beating and it’s also oven safe. Really, it’s hard to find a downside when it comes to this particular set, as most of the ‘cons’ for this set are really really small, making this one for the books. Will get damaged if you use metal utensils. Whatever your reasons to look for an anodized cookware set, the first thing you want to make sure of is that they work with your stovetop. If you own a gas stovetop there’s nothing to worry about, but if you have an induction stovetop? Then you need to look extra hard in order to find a set that works for you. Well, look no more! The Circulon Circulon Premier Professional cookware set is induction compatible, non-stick, highly conductible and very, very nice to look at. 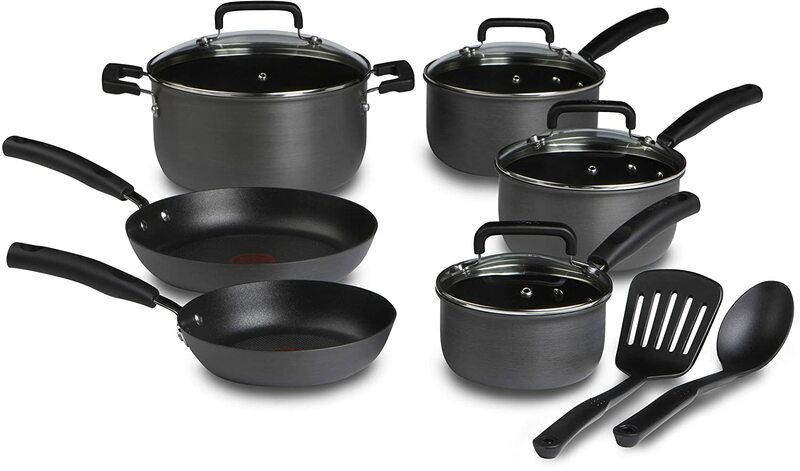 The pans are comfortably light weight, while still heavy enough to stay in place; the sauce pans come with drain spouts that makes them super convenient, there are several types of pans and pots that will help you cook just about anything and they are good induction cookware and gas stove cookware alike. The pieces included in this set are very well made. They come in various sizes, are easily stackable, have amazing non-stick abilities and are easy to clean. That said, you do need to use rubber spatulas and wash them with soft sponges if you want to keep them in good shape. So keep that in mind. While this is a small set, with only 10 pieces (including lids), this is by far one of the best cookware sets the market has to offer. Made to last, this set is wonderful with heat conduction, which means you’ll be able to cook even the most delicate recipes, as the risks of overcooking your food are quite minimal. The handles are made with silicone and rubber, which allows them not only to stay cool to the touch but also give you a good grip, which is crucial when you’re in the kitchen. This set is also induction compatible and, best of all, it comes with different add-ons that you can buy to make your set even more complete, including casseroles, steamer inserts, pasta inserts, skillet, chef’s pans and more. As with every other hard anodized cookware sets, you’re not supposed to use the dishwasher when cleaning these, and you shouldn’t use metal utensils either. 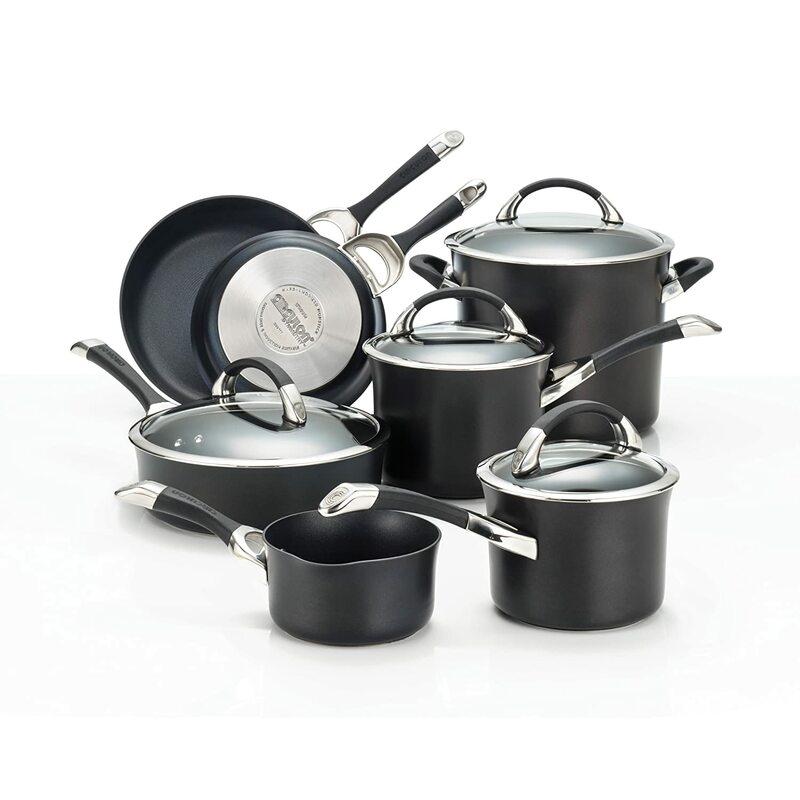 We’ve featured Calphalon before, since this brand is fantastic at making high quality anodized cookware sets. However, there’s always room for improvement and that’s exactly what Calphalon has done, which is why we’ve changed last year’s selection (Calphalon Simply Calphalon) for the Calphalon Unison, a 10 piece non-stick set that’s bound to make you fall in love with cooking all over again. So what’s so special about this set? This top of the line set comes with two types of non-stick surfaces. The super smooth one you can find in the sauce pans, which works wonders with omelets, pancakes and other delicate foods; and a rougher coating, which works best for sautéing and searing your food. This, plus the fact that the set is oven safe up to 500 degrees, gives you an amount of versatility rarely found in cookware sets, which means you’ll be able to cook a variety of recipes without having to purchase anything other than your ingredients. Another wonderful characteristic of this set is its built. Not only is it sturdy and heavy, but it also comes with handles that lets you move each piece easily. No, we’re not talking about the regular handles. We’re talking about extra handles, similar to the ones you’d find in pots, that gives you more control when moving around the kitchen. Practical as they might be, these handles do make storing these pots and pans a little harder, so keep in mind space restrictions before purchasing this set. While dishwasher safe, hand-washing is recommended, as the nonstick surface does need to be treated with care. For this exact reason, you should never use metal utensils with this set. 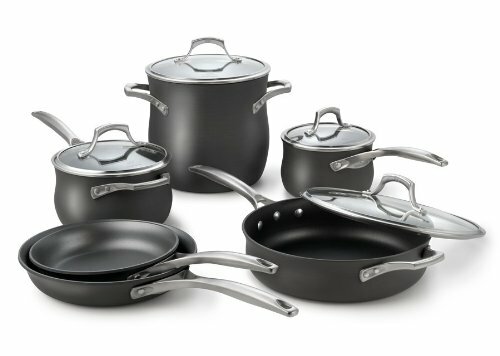 This set is on par with the Calphalon Unison set above, but more affordable. 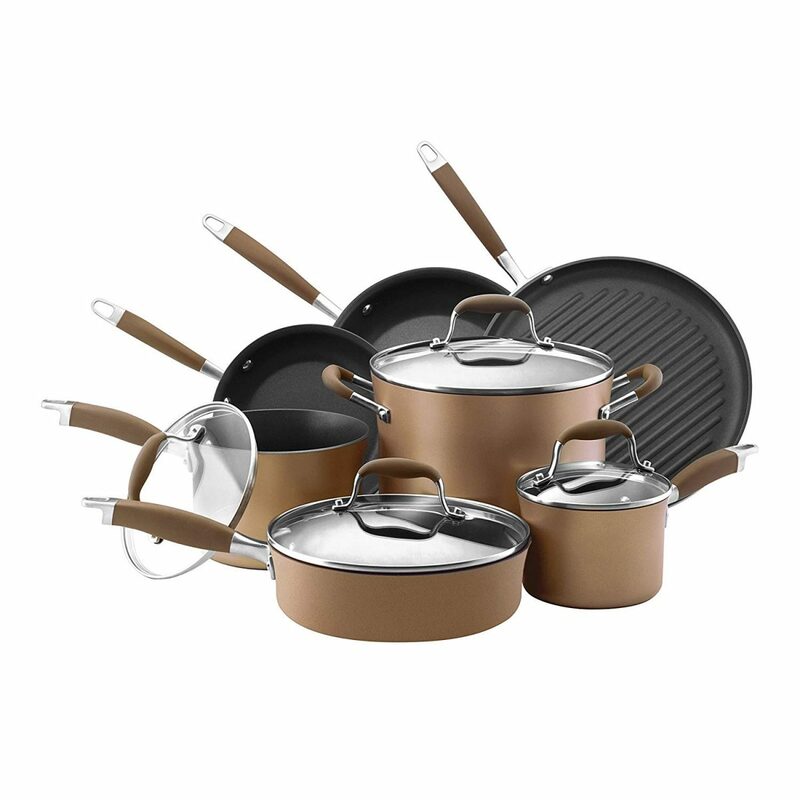 This eleven-piece bronze anodized cooking set has frying pans, sauce pans, a stockpot, and a grill pan. This set is oven safe to 400 degrees, triple-coated nonstick, and affordable, which is a great combination when it comes to cookware. One of the best characteristics is that the handles are a combination of stainless steel and silicon that are covered in SureGrip. Not to mention that the bronze color is very elegant. The nonstick surface is very reliable and reacts very quickly with heat, which is exactly what to look for when it comes no anodized cookware. Unfortunately, they cannot go in the dishwasher. If what you’re looking for is something that goes above and beyond the regular benefits of anodized cookware, this is the set for you. Petroleum free, ceramic based and completely free of PTFEs and PFOAs, this is the kind of set you want to buy when you’re serious about your health and your family’s. If cooking with stainless steel isn’t your thing but you don’t want to give up the convenience of non-stick, you’re going to love the GreenGourmet line, as not only is this set affordable but also easy to clean and even easier to use. There are a couple of things you need to keep in mind when considering this set. 1. This set isn’t dishwasher safe. You’re going to have to hand wash using warm soapy water and a sponge. Nothing too abrasive, as that can mess with the non-stick properties of this man. 2. The pieces in this set are rather small, and may not be enough for those thinking about cooking for an entire family. 3. The pans need to be seasoned before using to maximize their effectiveness and, if possible, seasoned again after a couple of washes. 4. You can’t use metal accessories when cooking with these. While we realize that there’s a certain amount of maintenance you need to perform to extend the life of this set, we assure you it’s more than worth it and it will be a wonderful new addition to your kitchen. What's The Best Hard Anodized Cookware? We’ve come to the end of our list of the best hard anodized cookware sets and I think it's time to choose the winner. They are easy to clean, stack together nicely. The material in these cooking set is excellent. Food doesn't stick, and the oil doesn't burn. It bring lots of selections. What Are the Downsides of Anodized Cookware? There’s not such a thing as perfection, even when it comes to cookware, so anodized aluminum does have its flaws but they’re few and far between and are mostly present just when compared to regular aluminum. 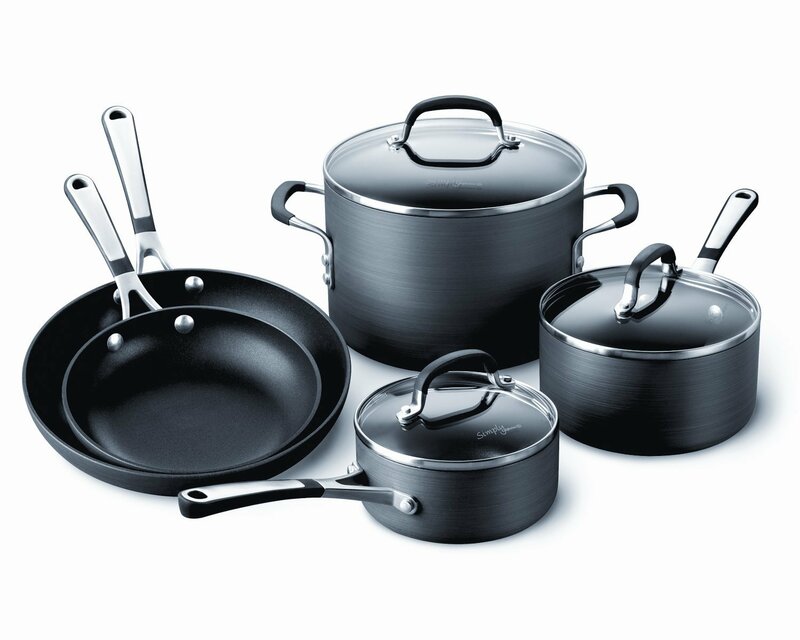 Read them below to choose the best hard anodized cookware. Is more expensive than the non-anodized version. Heats up slower than the non-anodized version. Requires more care than the non-anodized version. Because anodization is a process, it can be undone. The anodized surface will wear off with time and use but this process is sped up by washing harsh chemicals, scrubbing the dishware, using a dishwasher and more. In general, you should only hand wash your anodized cookware with a sponge and mild soap before letting it to air until dry. While anodized cookware has already been treated it’s always a good idea to season it. After all, nonstick surfaces that don’t use Teflon and other chemicals can always use the extra help to ensure the best results. ​Wash your cookware thoroughly using a sponge and mild soap. ​Once dry (you can dry using a dish towel, paper towels or letting it dry on its own) put in high heat and use your sponge to spread a generous quantity of cooking oil all over the interior surface, all the way up to the rim. ​Remove from heat once it begins to smoke and let it cool. Once the pan is completely cold, use a paper towel to remove any excess oil and you’re done, you’ve seasoned your anodized cookware. Wash with warm water between uses and, if you end up needing soap to remove stubborn food, season again after doing this.